Wheat germ oil is an unrefined oil that is obtained from the germ of the wheat kernel. It is the richest source of Vitamin E than any other vegetable oil. It also has a high content of Vitamin A and Vitamin D. It is rich in protein and lecithin. It is very popular for external application due to its beneficial effects on the skin. Hence, it is increasingly finding place in the manufacture of skin care products. Other benefits of wheat germ oil include its antioxidant properties and its effect in strengthening the immune system and restoring overall health. 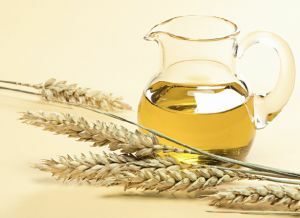 Obtained from the embryo or kernel of the wheat grain, wheat germ oil is a light yellow, fat soluble natural oil. As it is an unrefined oil, it has a thick consistency and a strong aroma. Although the germ of the wheat forms only 3% of the weight of the wheat grain, the benefits of wheat germ stem from the fact that it contains almost 25% of the total proteins, vitamins and minerals of the wheat grain. It is a very sensitive oil that tends to degrade if not stored with care. It should be kept away from high temperatures because if exposed to extreme temperatures, it may turn rancid. However, if kept properly, the shelf life of wheat germ oil can be extended up to a few months. The benefits of this oil include curing skin conditions like psoriasis and eczema. It works effectively to heal burns and skin ulcers. As an external application it is very helpful for dry skin. Wheat germ oil is beneficial for the general health of the skin as it improves circulation of blood in the skin when used externally. It also helps the skin cells that may have been damaged due to the scorching heat of the sun. It also fights off conditions like dermatitis and reduces scarring. Health benefits of this oil include improving the overall working of the heart. Research has shown beneficial effects of octacosanol and specifically policosanol in improving cardiovascular functions. Policosanol has been found to be effective in controlling production of cholesterol by the liver. It is believed to raise the level of 'good' cholesterol and reduce that of 'bad' cholesterol. Wheat germ oil is known for its antioxidant properties. Hence it helps in preventing the skin from bearing the signs of aging. It is probably this reason that it is added to other carrier oils. However, it is used in lower amounts to prepare carrier oil blend as it is high in nutritional value. Linoleic acid, oleic palmitic and stearic fatty acids are the essential fatty acids present in wheat germ oil. These essential oils cannot be manufactured by the body. Hence they should be taken externally as they improve the immune system, the nervous system and help in healthy cell growth and regeneration. Wheat germ oil is particularly high in a long chain saturated primary alcohol called octacosanol. This compound was reported by some athletes in the 1960s to enhance their performance. Octacosanol in particular was believed to increase endurance and muscle strength in sports persons. Though there isn't much scientific evidence about its beneficial effects in improving fitness or athletic performance, some studies have shown that octacosanol and policosanol cause a mild improvement in reaction time.